Autodesk Inc., a world leader in 3D design software for entertainment, natural resources, manufacturing, engineering, construction, and civil infrastructure, has released Inventor HSM 2018.2.2 (R3) Build 5.3.2.65, is an integrated 2.5- to 5-axis CAD/CAM programming solution for Inventor. - Fixed missing output of rotaries issue for posts with subprograms. - Add missing G90 after machine retract for CR Onsrud 5-axis Router post. - Add missing G90 after machine retract for DMS Router posts. - Add missing G90 for 5AXISMAKER post after machine retract. - Add missing G90 for HAAS posts after machine retract. - Fixed SafeZHeightForWorkpiece for DATRON next post. - Updated multi-axis support to handle rewinds better for Pocket NC post. - Added support for setting machine type for Intelitek post. - Added post for TRUMPF laser cutting. - Added posts for CAMaster with WinCNC control. - Added property to set 4th axis if available for Mach3Mill post. - Added property to control tapping mode for FAGOR post. - Added property to reverse the direction of G2/G3 for ProtoTRAK turning. - Fixed canned cycle XYZ output for DATRON next post. - Fixed tool definition issue for CAMplete APT post. - Fixed color for etching for Universal Laser post. - Fixed work offset for angular probing for HAAS UMC-750 post. - Added forced multi-axis reset for Heidenhain posts when switching between indexed and simultaneous machining. - Fixed potential failure when using for HAAS Next Generation M130 post. - Fixed YZ axis inversion when secondary spindle is active for Doosan mill-turn post. - Fixed thread orientation issue for tapping with chip breaking for HAAS posts by using G99. - Removed G17/G18/G19 for G2/G3 to avoid issues for circular moves for Siemens 802D post. - Fixed circular move for Anilam Conversational post. - Updated description for Othermill post. - Changed default to only output cutting for Universal Laser DXF post. - Added support for G54.1P for Mitsubishi post. - Added DMG Mori NHX post. - Added AMADA laser post. 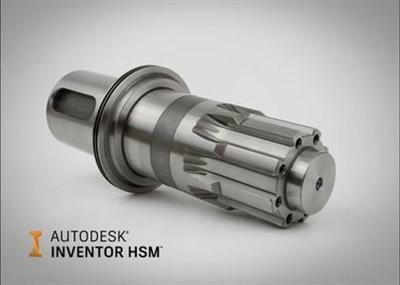 About Autodesk Inventor HSM. Autodesk HSM 2018 software bundle provides the best value in integrated CAM software available. Included are HSM add-ons for SOLIDWORKS and Autodesk Inventor. Integrated CAM helps CNC programmers, designers, and engineers rapidly produce machined parts in one seamless workflow, while maintaining model associativity for quick updates to part changes. Whether you are working with multiple CAD formats or starting from pencil sketches, Integrated CAM with your design software is the simplest and fastest way to machine your parts. Take advantage of the best-in-class toolpath strategies for 2.5D, 3D and 3+2 milling applications. Inventor HSM software not only provides all the conventional machining strategies, but it also generates smooth linking moves that reduce machining time and increase machine and tool life. Software Prerequisites: compatible with the 2016 or newer versions of Inventor Professional or Inventor LT.
Autodesk Inventor HSM 2018.2.2 (R3.2) Build 5.3.2.65 | 348.3 mb download links are provided by Extabit Rapidshare Uploaded Rapidgator Netload Bitshare Freakshare Letitbit Dizzcloud and more.